At the beginning of every hiking trail, there’s a kiosk with information the hiker should know, most importantly a map and the rules of the area. Located as we are at the edge of the White Mountain National Forest, we do a fair number of these trail head kiosk signs. 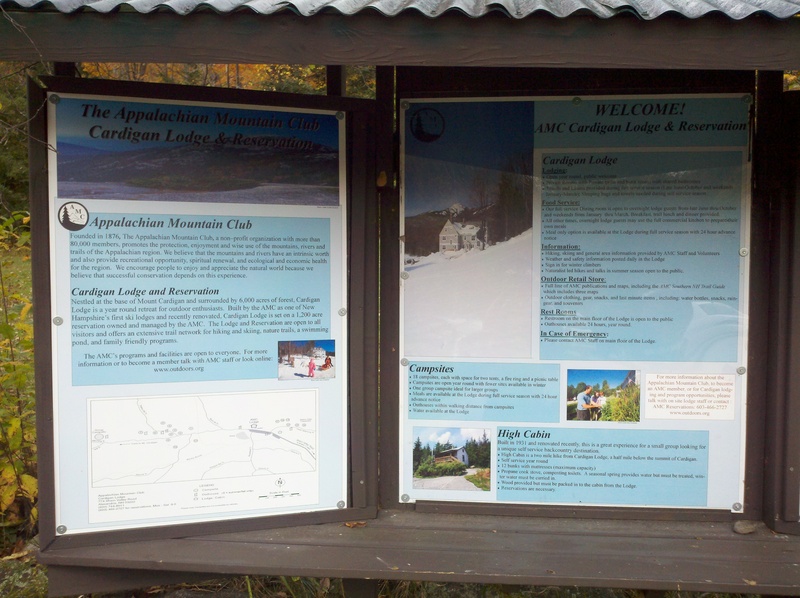 Most recently, we did these for the Appalachian Mountain Club’s Lodge at Mount Cardigan. The trail head kiosk signs are printed on 1/8″ Sintra using our UV flatbed machine. The inks go straight onto the board, which is a real time saver. The inks are also very stable in sunlight, waterproof, and durable. Sintra is a foamed PVC sheet that’s very good as a sign making material, and the inks are bright and happy on it. In this application, the AMC put a piece of clear plexiglass over the kiosk signs, just because they expect a lot of people poking at them with their hiking poles. Cardigan Lodge gets a lot of traffic. This entry was posted in Flatbed printing and tagged kiosk signs, trail head signs, trail signs. Bookmark the permalink.